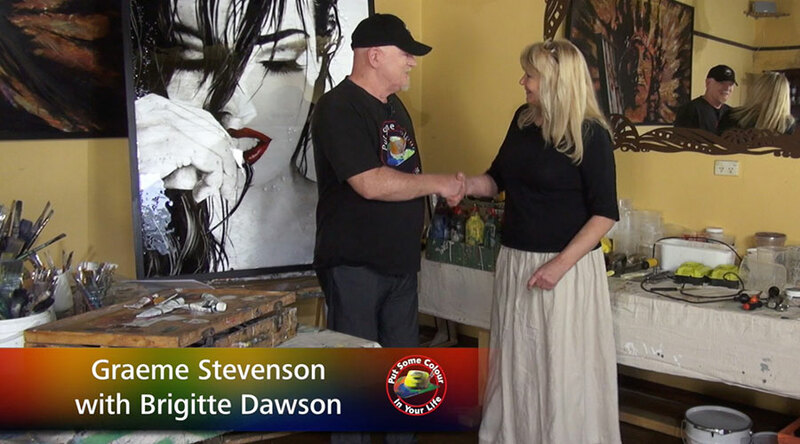 Mixed media artist Brigitte Dawson lives a unique life focused on creation and creative collaboration. All of her years of varied artistic training have helped Brigitte Dawson develop a unique style, which Brigitte describes as “a mix of realism and loose expression.” Most of her work focuses on the human figure and animals, especially horses. “So many things stir my passion to create,” she says. “I love the human form and faces. I love to paint animals in all their wonderful glory or vulnerabilities. I would love if people could appreciate and love what we have on this earth.” She draws much of her inspiration from things that make her “feel something good” or smile, including quotes and spiritual themes. She is also passionate about subject matter that invokes powerful emotions and old memories. She has found inspiration in the work of a variety of artists, from Michelangelo and Rembrandt to Voka, Elise Genest and Kristen Knight. Brigitte Dawson has her current studio at 129 Sth Gippsland Hwy in Tooradin, where she paints and helps run a restaurant gallery. She belongs to a number of arts organisations, including the Tooradin Arts Group, Penninsula arts group, Frankston Visitor and Victorian Arts Society. She has received four people’s choice awards and special commendation for both her painting and her bronze. Viewers have often called Dawson’s art “soulful” and “beautiful.” She is incredibly appreciative of the praise her work has received. “My favourite is when people love the mood or the moment that I’ve been able to create,” she says. Brigitte Dawson’s work has also been featured in exhibitions, magazines, and newspapers and been on consignment in galleries and commercial businesses. Along with her prolific mural work, she has also painted backdrops for major television shows and sculpted props. She has recently participated in the television series Colour in Your Life. When she is not creating art,Brigitte Dawson enjoys spending time with her children, horses, and dog. She also likes to stay fit and go to the beach. Along with her main body of art,Brigitte Dawson also works with her son to create art for children in a business they call ‘Peek-a-view’. This came about as a project to give people affordable murals for children’s rooms. Art for little ones. Along with canvases in three sizes there is now a book in production. Brigitte Dawson’s love for art has pervaded every aspect of her life. She passionately continues to create and share her vision with the world in the formats she has mastered through her years of training and experience.